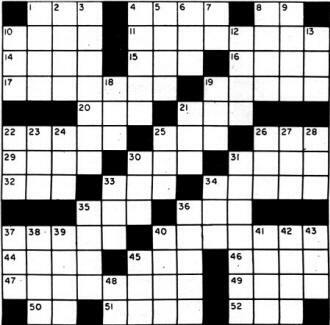 Crossword puzzles have probably lost their appeal to most people. I suspect so because up until early this year, I created a custom electronics-themed crossword puzzle every week for RF Cafe visitors, but not a single person has written to ask that they be continued. Oh well, that saves an hour every Sunday. Lots of magazines used to print crossword puzzles based on their readers' interests. 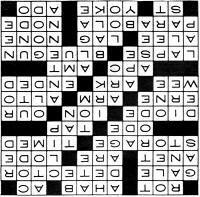 Unlike the RF Cafe crosswords that use only relevant words, those puzzles used common filler words where it was too hard to find a thematic word. 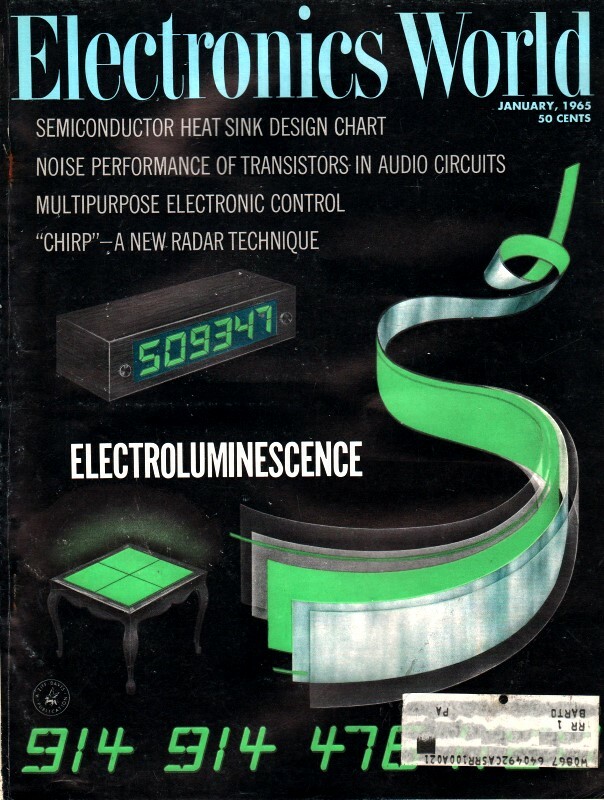 This crossword puzzle from a 1965 edition of Electronics World does a pretty good job of using a majority of electronics-related words. Enjoy. 8. Type of current (abbr.). 11. Commonly, the stage or circuit in a radio set that demodulates the r.f. signal into its audio or video component. 15. Part of "to be." 17. " ____ tube," special CRT. 19. Made to occur at or during a set period. 21." _______ switch," a multi-contact switch, usually rotary. 22. Component having two electrodes; one a cathode and the other a plate or anode. 25. Atom or molecule which has fewer or more electrons than normal. 30. "Swinging _," a type of mounting and feed used to move cutting head at uniform rate across the recording disc in some sound recorders. 31. "____troposphere"; that portion of the atmosphere located about 40-60 miles above earth's surface. 35. Tube circuit in color-TV receivers which keeps both frequency and phase of 3.58-mc. color oscillator synchronized with burst signal (abbr.). 40. Electron gun in three-gun color CRT which provide beam striking the blue-emitting phosphor dots of screen mosaic (two words). 44. On the sheltered side. 45. Delay in the recording or display of any device with respect to the conditions being measured or reproduced. 47. Type of curve formed by intersection of cone and plane; the plane being parallel to edge of cone. 49. Any point, line, or surface in stationary-wave system at which amplitude of wave-shaping variable is zero. 51. Coil assembly used to produce electromagnetic deflection of electron beam in CRT television tube. 2. Substitute for "the more expensive spread." 8. Smallest unit of any chemical element. 9. One type of communication. 10. Substance with a boiling point below normal ambient temperatures and pressures. 23. Former name of the industry's engineering society (abbr.). 30. Intense luminous discharge between electrodes and conductors. 37. "Over ________ ," the amount by which effective height of scanning facsimile spot exceeds nominal width of scanning line. 39. Saucily free and forward. 40. Stop short and refuse to go.